With a lap time of 1.06,811 minutes for the short course of the Hockenheim circuit, the TECHART driver Jörg Hardt won the GT class . 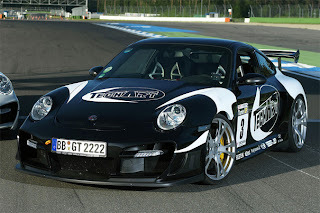 TECHART’s overall victory at the sport auto Tuner Grand Prix 2008 again demonstrated the company’s unique positioning on the car enhancement market. The specialists from Leonberg-Höfingen were able to draw on more than 20 years of experience when preparing the vehicle and modifying the Porsche vehicles from Zuffenhausen. In order to participate in the sport auto Tuner Grand Prix 2008, the black/white TECHART GTstreet RS was required to obtain certification to prove the vehicle’s road-worthiness. It was also required to meet the specific requirements set by editors of the sport auto magazine. In addition to its powerful TECHART biturbo engine, with an output of 700 hp / 515 kW at 7,000 rpm and a maximum torque of 860 Nm at 4,500 revs, the height-adjustable sports suspension and tires were crucial to securing success in this competition. The TECHART sports suspension was developed in combination with the TECHART engineers and with vehicle experts from Bilstein so as to be specially adapted to the short course at the Hockenheim circuit. Jörg Hardt, who is one of the most successful drivers in the Porsche Carrera Cup, was very enthusiastic about the vehicle: “The car was prepared to perfection”. 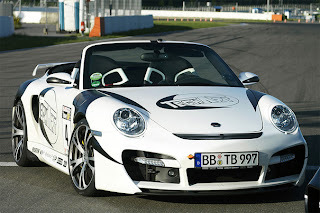 In addition to its overall victory, TECHART Automobildesign also clocked up an additional success in the Cabrio category: Jörg Hardt drove the 580 PS / 441 kW TECHART GTstreet Cabriolet to success in the Cabriolet class with a lap time of 1:10,382 minutes. Given the tropical temperatures of the Whitsun weekend at the Hockenheim motodrome, it was crucial to use the perfect kind of tire. TECHART’s technology partner, Michelin, contributed its high performance tires Michelin Sport Cup Plus to it. tags: Car, Cars News, Sports Car, Custom Car, TECHART, TECHART Champion, Grand Prix, Grand Prix 2008, Grand Prix 2008 Champion, Google , Google News, Yahoo News, Bing News, TECHART wins sport auto Tuner Grand Prix 2008.
ty :) Keep promoting my website !